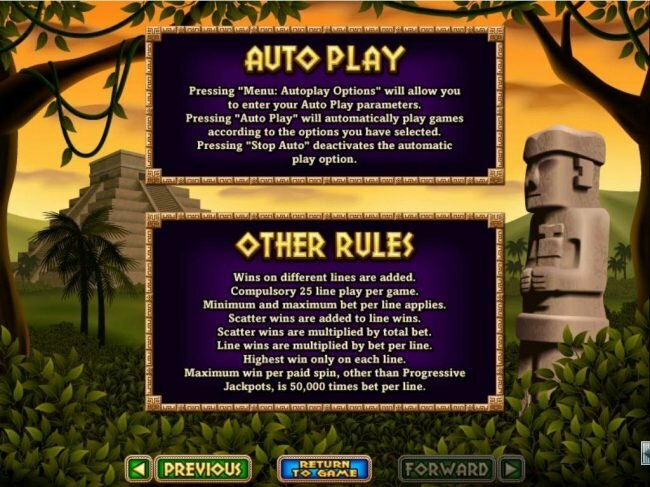 Spirit of the Inca is a 5 game reel slot with a maximum payout of $10,000 using the lost civilization theme. 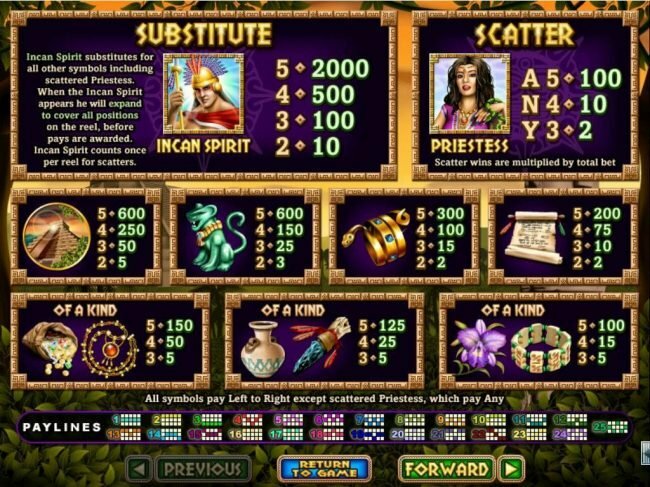 Spirit of the Inca Slots 4 out of 5 based on 2 ratings. 2 user reviews. 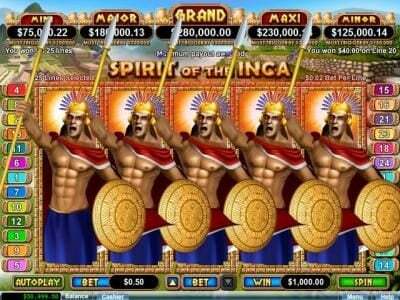 Spirit of The Inca is a 5 reel, 25 pay-line video slot game that has been created by the incredible software developers Real Time Gaming. This game comes jam packed full of features like a free spins bonus, a wild symbol, a scatter symbol and so much more. There is a maximum coin jackpot worth up to 2000 coins and then there is a $400 maximum jackpot. Anyone will have the ability to win these jackpots if you play it good enough. Every symbol in this game is themed to mimic the background of the game. This means you will see slot symbols that resemble the Incan time period. Some of these symbols will include Bone Jewelry, Beads, Scrolls, Jade Lions, Priestess, Ceramics, Flowers, Treasure, Asp Bracelets, Machu Picchu and Incan Sprit Designs. 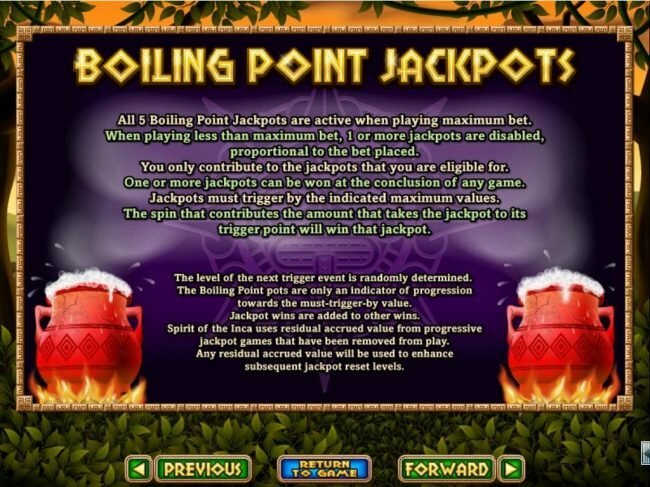 If you have ever played a Real Time Gaming Game before then you will be familiar with the multiple different progressive jackpots that they have to offer. Well in this slot game they will have Mini, Minor, Maxi, Major and Mega Progressive Jackpots. Each one of these progressive jackpots will increase in size with the mega jackpot being worth over two hundred thousand dollars or more. This can be a huge amount of money to win and every player will be playing their hardest to win the progressive jackpot. You will notice that there are two scatter symbols in Spirit of the Inca. Each one of these scatter symbols has a different purpose. The priestess scatter symbol will reward you with some coins and so will the other Incan Spirit symbol. You will either be able to win 100, 10 or 2 coins from this feature. The Incan Spirit will also act as the wild symbol to. This means that the Incan Spirit will replace all of the other symbols in the game except for the scatter symbol in order to create you a winning combination. This can end up winning you a large amount of money in this game. You will also be able to play a bonus game within this Online Casino slot game. 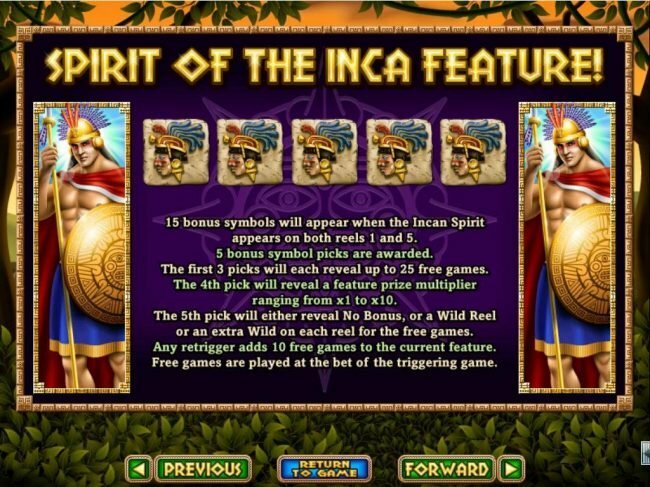 The bonus game is called the "Spirit Of Inca". What will happen in this bonus round is that five symbols will appear on the screen and then you will have to choose three of them. You will be given up to 25 Free Spins through this Bonus round if you choose the right symbols. 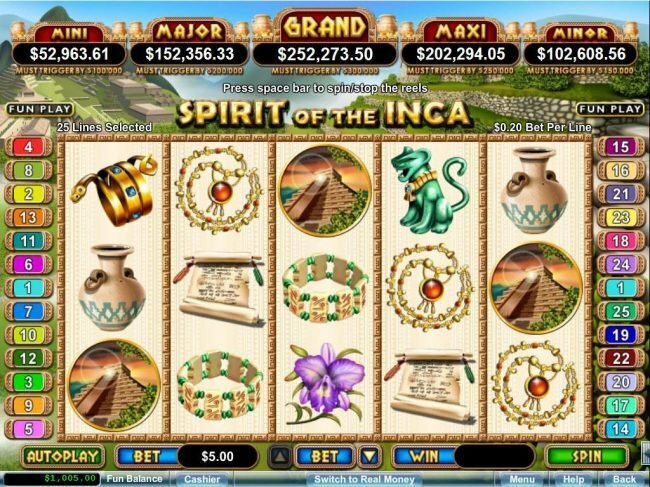 All in all we have found that Spirit of Inca is more than just your average slot game. It truly is a slot game jam packed full of features that will help you win big money. The game appearance is more than appealing and the sound quality is detailed. Overall you can be happy to know that this is one of the best Slot games that you will be able to play in the year 2013. Do not use multiple no deposit casino bonuses back to back as your winnings may be removed without making a deposit. Do not use more than one No Deposit Casino bonus back to back as your balance could be voided without making a deposit. Do not use more than one free casino promotion back to back as your winnings may be removed without a deposit. Be sure you do not use multiple Free Casino Bonuses as your balance could be removed without making a deposit. Do not use more than one no deposit promotion as your balance may be voided without a deposit. Be sure when you use a no deposit bonus code from Uptown Aces as with most RTG run casinos, you have to post a qualifying deposit between No Deposit Casino promotions. 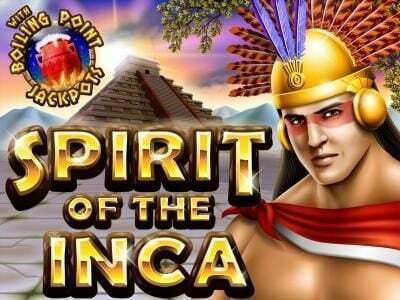 Spirit of the Inca video slot in my opinion is not the easiest slot to win anything with. I am not a fan of this game because the wins are far and few between and not worth the money you have to put into it. The progressives I have not seen or even heard of anyone winning one yet either.